Best time to surf in Nicaragua for Beginners: All year, though smaller swell can be found in March/April and September/October. Surfing in Nicaragua was pioneered by Nicaraguan surfer Ronald Urros in the late 1970’s who spotted the many beaches and wave set ups as he was flying to neighbouring Costa Rica in a helicopter and vowed to return. He did return and with friend Carlos Deshan in tow and they camped on the beach at Popoyo throughout the 1980’s and tackled some outer reefs in the area when the bigger swells came marching through. It was during the 80’s that more surfers traveled here with Brazilian surfer Adrian Kojin riding his motorbike from the hazy shores of California all the way down and through Nicaragua discovering barrelling and empty waves north of Popoyo. It wasn’t until the early 90’s that the Nicaraguan surf scene began to boom as the democratic elections took place in 1990 which thankfully ended the country’s civil war which the Ministry of Tourism decided would be the perfect time to promote the country as a world class surfing destination! The first documented trip of foreign pro surfers was in 1992 when the late Brock Little and Matt Archibald rocked up and surfed the point break at Manzanillo and other un-named waves courtesy of the Surfer Magazine sponsored boat. What's the surf like in Nicaragua? Nicaragua is truly a surfers paradise, this is due concentration of great surf spots being located in the more developed southwest corner where a narrow stretch of coastline separates the largest lake in Central America, Lake Nicaragua from the Pacific Ocean. This gigantic area of water creates a perfect climate with the best atmospheric conditions for surfing in Nicaragua… Offshore winds for pretty much every day of the year! The best time for a Nicaragua surf holiday is from March to October. This is the main Nicaragua surf season, southerly low pressure pours into the coastline with continual 1m swell pulses meaning you will always be able to score some waves, even in the middle of the dry season, which is known for fewer swells, it will rarely go flat making the dry season months the perfect time for beginners to be introduced to surfing. Only October seems to suffer from regular SW-W onshore winds but don’t worry they only start to blow late morning, meaning there’s still offshore winds blowing for the dawny! The tidal range reaches 2.5m but tides are still a crucial element at many of beaches and point-breaks in Nicaragua, your surf instructors and guides will have all the information on what Nicaragua surf spots will be at their best on any given tide. The main roads leading into the towns are of a standard Central American quality, expect the odd pot hole but they are safe to travel and get you where you need to go. As surf tourism goes from strength to strength on a weekly basis new roads are popping up almost weekly, so those uncrowded peaks that took a 4x4 an age to reach can now be accessed by everyone wanting to score an empty slice of perfection. Where to surf in Nicaragua? San Juan del Sur’s beaches are a great place for all levels of surfers. The most popular and easily accessible surfing beach close to town is Playa Maderas, where both beginners can take surf lessons and experts can find great waves and relatively crowded line ups. The jewel in the crown here is Popoyo which is often regarded as the best wave in Nicaragua. Known as the Emerald Coast it boasts a higher concentration of world class surf breaks than just about anywhere else in Central America and has some of the best Nicaragua surf camp options. The area has a laid back atmosphere with the majority of locals working within the tourist and fishing industries. Expect to surf by day, relax in your hammock on the sand in between hitting the waves and enjoy cold beer and delicious fresh fish in the evenings! 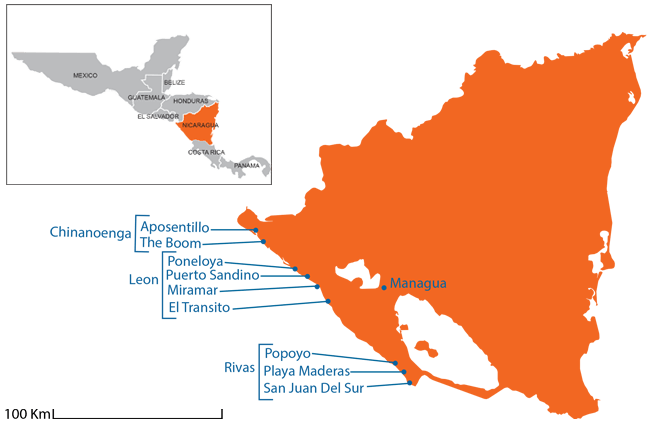 As with most flights into Nicaragua you will fly into Managua Airport, from there you can a taxi, shuttle or public transport to San Juan Del Sur in the Rivas Provence, which takes around 2 hours. Alternatively you can have a connecting flight from certain destinations that will take to the nearby Costa Esmeralda Airport which is located just south of Rivas. Founded by the Spanish, León is the second largest city in Nicaragua, after Managua and rivals other historic areas such as Granada for the number Spanish colonial churches, secular buildings, and private residences. A brilliant place to experience the history of Nicaragua in a quieter setting than other busier locations when your arms are too tired from surfing! It buzzes with energy that sweeps you up and is known as being a very arty city with many exhibitions and galleries to explore. You can party on any day of the week and feast on a wide range of cuisine which has become very cosmopolitan in the last few years. The best wave in the area is Poneloya and offers left and right walls perfect for beginners to get the basics on lock down before starting to learn a few more advanced tricks. Like the majority of the Pacific Nicaraguan coastline there are plenty more waves out there in areas such as Miramar, Puerto Sandino and El Transito, you just have to explore for yourself! Flying into Managua the best option is to either have your Nicaragua surf camp or hotel accommodation pick you up in their shuttle bus or to do what most of the Nicaraguans do and jump on the microbus known as UCA. It’s very cheap and easy to use and even easier, Leon only has one station so there’s need to worry about getting off at the right stop! Alternatively you can a taxi straight to Leon from Managua airport to your surf resort in Nicaragua but it will set you back roughly US$ 80. The further north you go the more chance you are to score quieter waves but it comes with a price… harder access. So expect to jump on the back of a 4x4 with your surf instructors to find some empty a-frame peaks all to yourself. The Boom is considered the best wave in the area and can provides some of the best beginner surf Nicaragua has to offer. looking to progress to the next level. The other beginner friendly beach is Aposentillo which offers great slow peeling green walls that are perfect for those who want to learn to surf Nicaragua and its best waves. The city of Chinandega is surrounded by some of the most beautiful landscapes in the whole of Nicaragua from Volcanoes to lush watering holes that are home to waterfalls that are perfect for escaping the dry heat in between surfs.In fact the stretch of road has a nickname, the "Free Surfing Road". You can get to Chinandega from Managua Airport on a micro bus as previously mentioned or from one of the other busses in Huembes Market taking 2.5 hours and costing $3.You can also get a mini bus connection from Leon terminal to Chinandega terminal every 15 minutes. The year is split into two seasons . Rainy season from May to November with the heaviest range seen in October and the more pleasant dry season from December to April. Early in the dry season is generally considered the best time to visit a surf camp Nicaragua for beginners when smaller Pacific swells fill into the numerous beach breaks and points. Weather along the coasts is very warm with day time temperatures averaging between 28°C and 32°C and night time temperatures ranging between 20°C and 24°C. Due to its location the temperature stays very similar all year round with the humidity increasing during the rainy season and temperatures only changing greatly with altitude. The water is warm, very warm in fact with the sea temperature never dropping below 26°C and reaching near 30°C as the wet season merges into the dry season around late October early November. Surprisingly there can be a small problem with constant offshore winds, it can make the sea seem a little chilly on dawn patrols, but for anyone coming from a cooler country will not find it a problem just pack a 1mm neoprene top.